With 180 Devotions for When Life Is Hard, you will discover just the comfort and encouragement your heart needs for the areas of life that truly matter to you, including family, finances, work, health, faith, and so much more. Whatever life brings your way-through every mountain and valley-you will encounter words that uplift and inspire your soul in this lovely devotional. 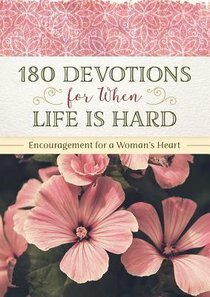 About "180 Devotions For When Life is Hard: Encouragement For a Woman's Heart"